T-bone accidents, also known as side collisions or broadside collisions, occur when the side of one vehicle is hit by the front of another vehicle. If you were involved in a T-bone accident, you may be entitled to compensation. The force of impact can push the vehicle in a new direction, potentially causing a secondary accident on a busy street. The vehicle could roll over when struck. These types of accidents often occur in areas with higher speed limits, which increases the odds of a serious injury. A study by the Association for the Advancement of Automotive Medicine found that the mortality risk in T-bone collisions is greatest when the accident involves a passenger car and sport utility vehicle, pickup truck, or minivan. The size difference between the two vehicle types puts the passenger car occupants at greater risk even after factors such as seatbelt use and general physical condition are accounted for. 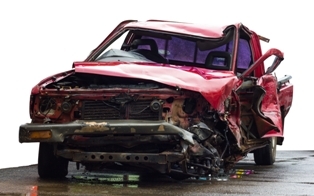 Side impact accidents are responsible for 25 percent of all traffic accident fatalities. However, they are also associated with a large number of head, neck, and back injuries. These types of injuries can often have devastating consequences. For example, a schoolteacher who suffers a serious head injury might be unable to return to full-time employment due to changes in reasoning, decision-making, concentration, and memory. A carpenter with serious neck and back injuries might need to reduce his work schedule or find a new occupation due to chronic pain or limitations in his range of motion. Less serious injuries from T-bone collisions include broken bones and muscle, tendon, or ligament strains. While these types of injuries might not cause permanent damage, they can still create financial difficulties in the form of medical expenses and missed wages from employment. Following a T-bone accident, it's advisable to enlist the services of a personal injury attorney who can help you negotiate a favorable settlement that protects you against the financial impact of your injuries. You're entitled to compensation for medical expenses, lost wages, and pain and suffering—even if you're found to be partially at fault for the accident. If you've lost a loved one in a T-bone accident, it may be possible to file a wrongful death suit against the negligent driver or other responsible parties. Damages in this type of case can be awarded to the estate of the deceased as well as directly to the surviving family members. Compensation includes payment for medical expenses up to the time of death, funeral costs, loss of income to support the family, and the pain and suffering for surviving loved ones. In a personal injury or wrongful death case, attorneys typically work on a contingency fee arrangement. This means your attorney accepts a percentage of the settlement as a fee for his services and does not require upfront payment. If no settlement is reached, you don't have any additional out-of-pocket expenses.